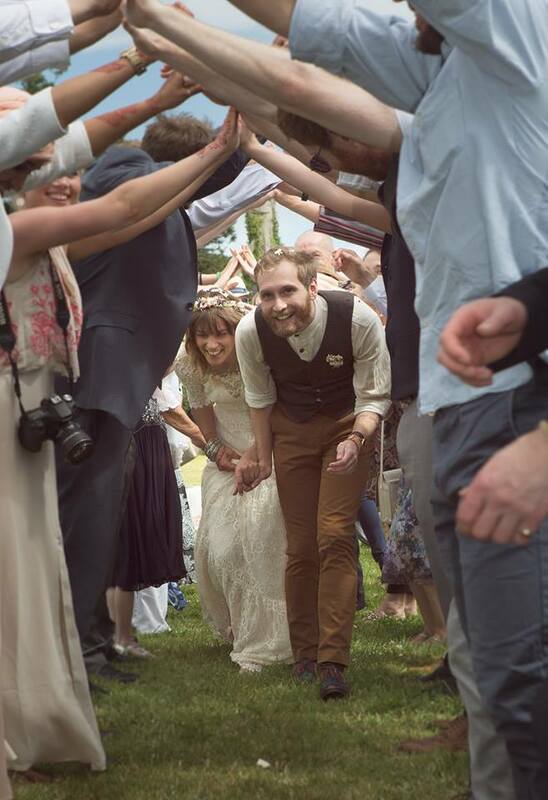 "Now the dust has settled we just wanted to email to say a massive thank you to you, Gordon, Sam and everyone who helped make our wedding the best day of our lives. You have been tremendous in the build up and on the day so we just wanted to say many many thanks." 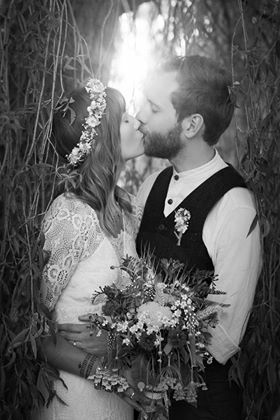 "Thank you so much for all of your hard work preparing and organising our wedding day. From the moment of meeting you and looking around Splotts Moor, we felt your warmth and hospitality. In the run up to the day, we felt that you had everything in hand and that really helped to minimise the stress our end. Our day itself was magical, the venue stunning and much fun was had by all. From our point of view, the day ran smoothly and we were just able to relax and enjoy ourselves (we hope you felt this too!). The marquee looked wonderful, better than we had imagined. Hilary - thank you so much for the table flowers. 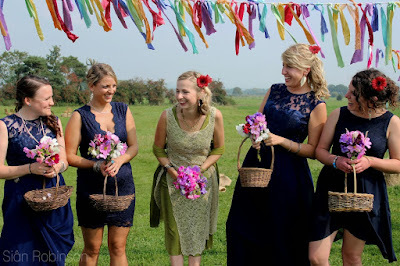 We know you had reservations about doing them, but they looked wonderful and matched the bouquets well! The night garden too was beautiful and we really enjoyed sitting around the fire until the early hours with some of our friends and catching up with them. Breakfast in the morning was a wonderfully relaxed affair, again allowing us to spend more time with our guests, which we really appreciated." We think Splotts Moor made a great backdrop to their 'mini festival' - it could be for yours too! We have very limited availability remaining in 2018 and are booking already for 2019, so contact Hilary and Gordon without delay at splottsmoor@gmail.com to avoid disappointment. 2018 is full of weddings! Splotts Moor is now booked up throughout 2018. 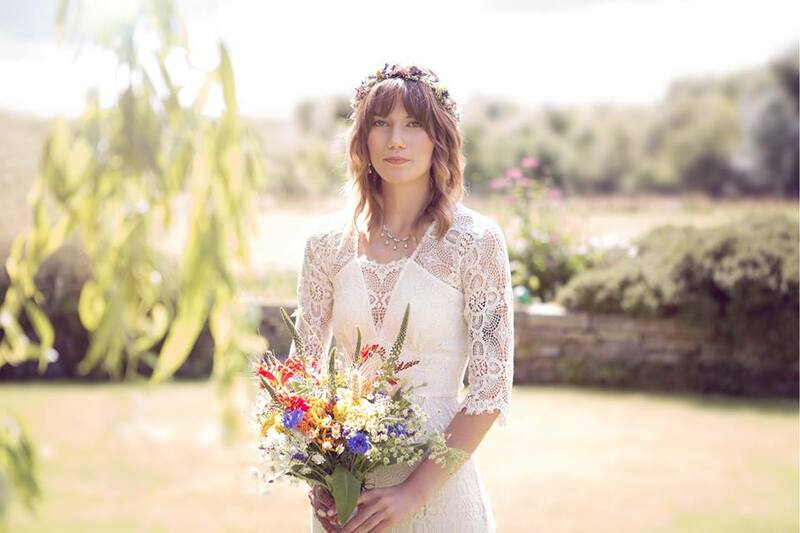 We had such a wonderful wedding day at Splotts Moor. We really cannot recommend the beautiful, unique venue more. Hilary, Gordon and the whole team were absolutely wonderful. They were incredibly helpful, creative and supported us in all our decisions - from having fireworks to a hot air balloon. It was a truly superb day and we cannot thank everyone at Splotts Moor enough for their hospitality. So many amazing memories. We are so happy we chose Splotts Moor as our wedding venue. We booked almost exactly a year in advance and loved every moment or organising it. Hilary, Gordon and the team are an absolute dream to work with. I'm fairly sure we used every tip when it came to local suppliers. We researched all the same but came back to the same suggestions each time. The venue is beautiful. We left it on the Friday and when we returned on the Saturday it was laid out not only with our decor but lots of gorgeous touches which really brought it to life. Last but not least were the team. All guests commented on how great they were, how friendly and helpful. I myself noticed through the night the little touches that only a bride would notice. We can't thank them all enough for their hard work and definitely can't recommend them enough!! The most magical, beautiful place; run by such an amazing family. So many special memories made here. 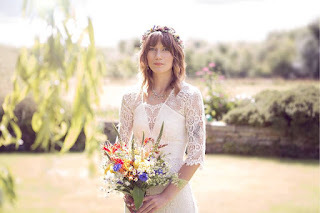 Splotts Moor was also featured on Tilley's Vintage blog this year as #1 Woodland Wedding venue near Bristol: "I defy any couple not to find the exact spot they are looking for here..."
What can we say? We are really looking forward to more celebrations next Summer! We are booked for events through 2016 and already taking deposits for 2017 - if you have something in mind for our beautiful grounds, get in touch today. Some choice pictures from some of this year's events at Splotts Moor, not least the flowering of (tiny) bananas on our banana plant! 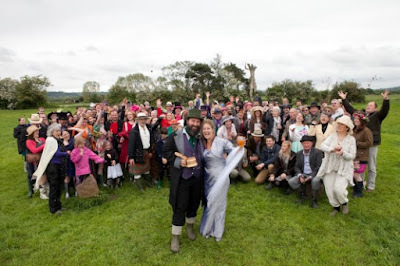 We've celebrated seven weddings and an anniversary at the farm this year. Congratulations to all our 2015 couples - Gemma & Alex, Kate & Marc, Sophie & Ernie, Sarah & Jack, Emma & Jim, Tom & Liz and John & Nicky - for choosing to have your parties here and allowing us to be part of your happiness. If you have pictures of your events that you'd like to share with us, please get in touch! The Farm is already booked up through 2016, and we're really looking forward to welcoming Amy & Matt, Hannah & Chris, Hannah & Joel, Hannah & Rich, Joanna & Luke and Elly & Chris next Summer. It's never too early to book here, if you're thinking of getting married or having any kind of celebration here in 18 months or more, let us know before it's too late! Looking forward to Summer 2015 - booking now for 2016 events! 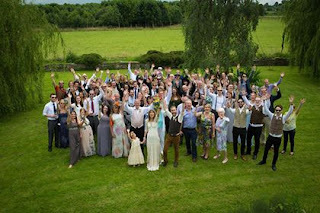 It's always both an honour and a delight to host important moments in people's lives, and especially such happy occasions as weddings, on our Farm. "...they mounted their ‘just married’ tandem, and did a lap of the ground past the stone circle and tree-carving of a smiling person, before gathering in the timber framed marquee unique to the venue. And what a venue." 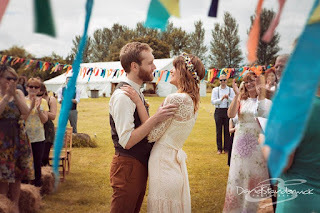 "It had the feel of a music festival and it was just lovely..."
"...the venue is just perfect for a laid back festival wedding"
"This is an amazing place just outside of Glastonbury. It has wonderful views of Glastonbury Tor one side and the stunning Somerset levels on the other. The owners are simply lovely and bend over backwards to give you the day you want. 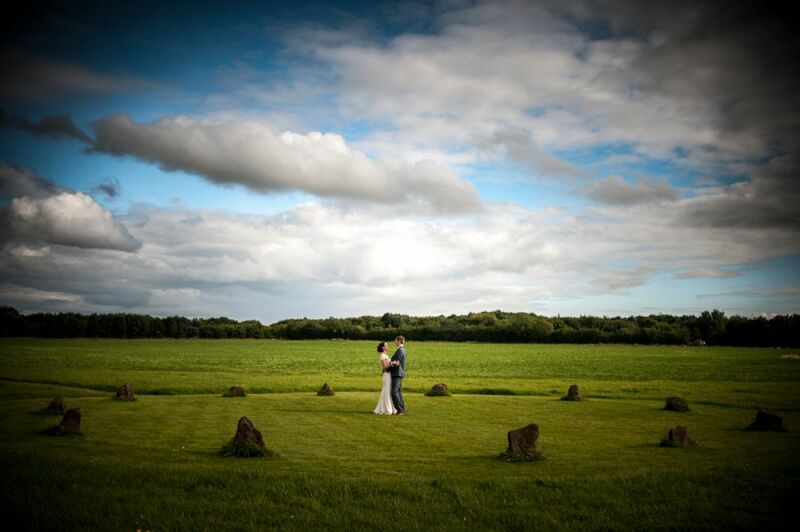 They have a purpose built stone circle on their land that, although it is modern, has been created with intent and love and the space is full of a gentle energy. There is accommodation in their B & B, and they allow camping if you want a “festival feel” to your celebrations. The marquee is stunning and is of a high standard, as is everything about this amazing venue. 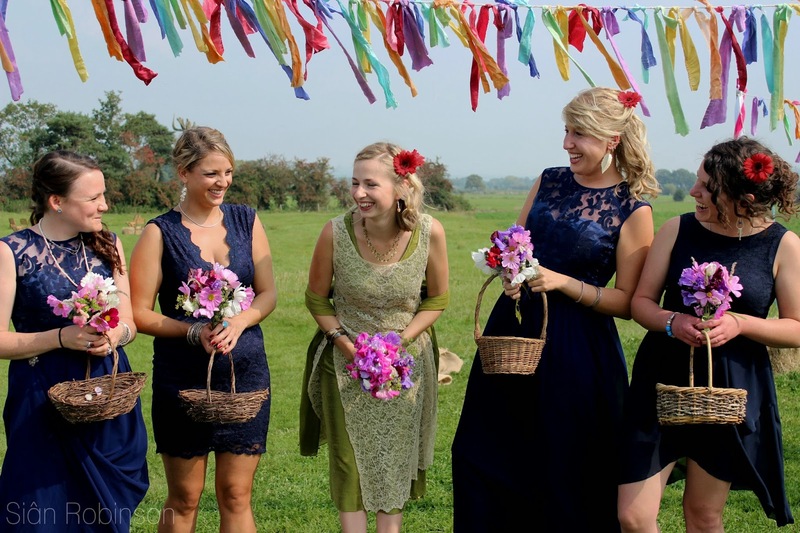 They book up for weddings very quickly so it is always good to enquire way in advance of your date." ...speaking of which, the whole of this year has been booked up for some time. We are really looking forward to welcoming more couples and partygoers onto our Farm this year. And there are just a few slots left next Summer, so get in touch now to book our grounds and purpose-built marquee for 2016!